What's the question you would ask PTA? I saw him at a premiere without a Q&A and realized I had nothing to ask him anyway. Cigarettes & Red Vines is teasing special screenings on their Twitter... details to come very soon apparently. They've just expanded the number of guilds that are allowed to RSVP, which gives me hope that I can snag one with ACE. I'll keep checking each day (as I have been doing). Probably the ones with Q&As will fill up before I get access. They're over-RSVPing, too. So seating isn't even guaranteed. That's standard. Even so, these screenings are never ever full. Woo! Just rsvp'd for Aero Theater on 11/29/2017 7:00 PM. Very excited. thats substantially shorter than I was expecting. I'm sure the film's as tight as possible, but I was really looking forward to that rumored 3 hour cut! Can we expect a second trailer? Announcement in 70mm at the music box theater in Chicago. And cigs and red vines said that they were announcing something soon. Possibly a early screening in 70mm? Better poster for sure! 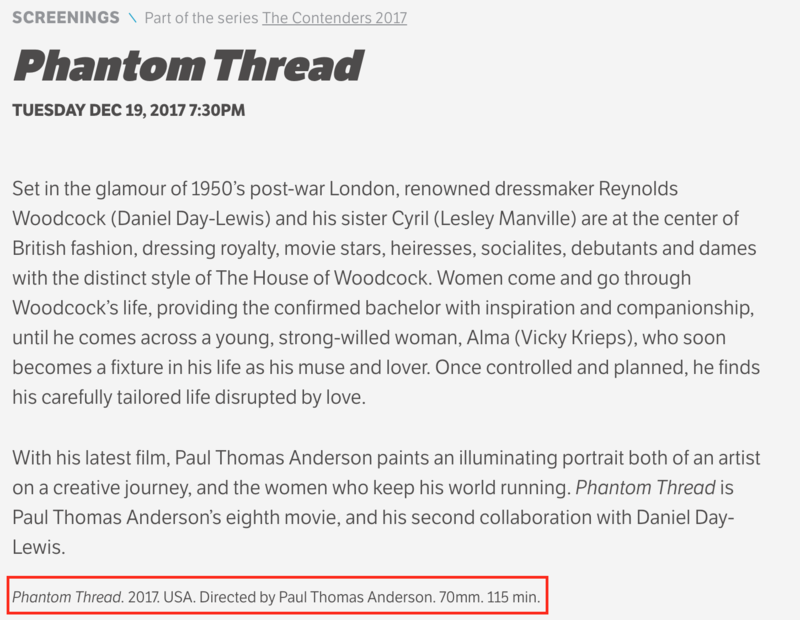 115 runtime is only 15 minutes shorter than The Master, which as much as I love it could have done with shaving off 5-10 minutes towards the end. Pretty surprised by the runtime. I wonder if this was more informed by the editing process with Tichenor or if PTA had determined that this would be a lean drama type thing early on in writing. I hope there's some additional footage like usual. I might be one of the few who think this but I would have been happy with an extra 5-10 minutes between Freddie leaving Dodd in the desert and returning to him in England.